Ken Wade won the Hotpoint AC match on the Horseshoe Pool. Peterborough Telegraph columnist Ken Wade won the Hotpoint AC match on the Horseshoe Pool at Decoy. Wade said: “started on the feeder with disappointing results. Runner up on peg 2 was Peter Howson who caught close in all day on meat for 95lb 4oz followed by Chris Shortland who feeder fished pellet for 93lb 3oz. 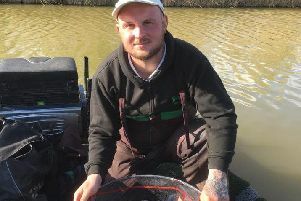 Webb’s AC fished the small carp lake at Kingsland Fishery a renowned ‘up in the water’ pool. It lived up to its reputation with Martin Harwood taking the honours fishing dog biscuit off the top after a slow start to finish with 105lb 13oz. Martin Parker came in second. Martin fished a small feeder all day for 85lb, followed by Ray Gregory fishing prawns on the bottom and weighing in 80lb 14oz. Out in front in Sunday’s match at Haddon Lodge was Lucio Melillio, who fished the pole with maggot and pellet to record 21lb 5oz. Runner up was Jim Ayres, who fished maggot and pinkie for 17lb 14oz, followed by Matt Skelton with 17lb 5oz. Ben fished 6mm cubed meat over hemp and meat tight to the far side to weigh in 95lb 2oz. In second place was Ramsey youngster Kieron Payne who fished maggot down the edges for 78lb 2oz, followed by Simon Godfrey on 76lb 4oz. In the Wednesday over 60’s fishery match on the Magpie Pool it was Vic German taking the honours with 114lb 14oz. Chatteris rod Dave Smalley was second with 86lb 14oz and Ray Pullman third with 85lb 6oz. Surprisingly there are not many anglers fishing the regular Thursday £1,000 qualifier at the fishery, so it’s well worth a midweek visit if you fancy a try at the big money final. The latest match fished on the Magpie Lake saw Mark Cross through with 127lb 2oz. Runner up was Jay Richardson with116lb 14oz, followed by Steve Dorks with 96lb 12oz. In the East Delph Match group contest on the Wagtail Pool at Float Fish Farm Fishery it was Ian Frith out in front from peg 20. He started on a short pole line with soft pellet over 4ml feed, later changing baits to meat and sweetcorn to keep the fish coming to finish with 157lb. Phil Jones came in second. He was just behind on 152lb 14oz caught on feeder and pole from peg 4. Third place went to Wally Warboys who drew peg 12 and caught well on a small feeder fished to the far bank rushes to weigh in 136lb 2oz. The regular open/league matches on a Saturday at this venue are certainly going to be seeing a few more anglers after last weekend’s results get around the local angling scene. Top rod again was Alan Marshall who drew peg 6 and caught on the long pole at full depth with meat, pellet and corn for 118lb. Second place with 116lb went to Stuart Redman who caught well with red maggot. In third place was Lionel Whaley with 92lb 12oz, most caught with luncheon meat down the margins. This Saturday Float Fish Farm have a drawn pairs. It’s £17 all in, with the draw at 11am and fishing 12 noon to 6pm.